IT ARRIVED IN A SMALL yellow bag, cut open lengthwise, with piping-hot red chile, ground beef, and beans poured directly over the corn chips inside, all topped with diced onions, yellow cheese, and lettuce. A server handed it to me across the lunch counter of the Five & Dime General Store in downtown Santa Fe. I was 10 or 11, and this, my first Frito pie, was magical. A rich and iconic New Mexican meal. Nearly two decades later, I am at El Paragua Restaurant in Española, anxiously awaiting another helping—the last meal in a yearlong culinary odyssey that has taken me and my partner, photographer Gabriela Campos, all across the state in search of the best Frito pie. Garcia co-owns the family-run business, which includes seven takeout restaurants, called El Parasol, in northern New Mexico, all of which make Frito pie. “We began serving this in the late sixties, early seventies,” she says, setting down two plates, piled high. She sips her coffee as we eat. The pies are salty and decadent. I detect a bit of brightness from the veggies and a spicy red chile that cuts through the richness of the Fritos. Delicious. As good as any I ever had. “It’s a simple, good food,” Garcia says. It’s New Mexico in a bag. THE FRITO PIE REMAINS A wonderful, if anachronistic, thing. It’s a combination of American junk food and traditional Southwestern ingredients—corn, beans, and chile. It’s blue-collar, unpretentious, and a bit odd. It’s like Cincinnati’s spaghetti-chili combo, Quebec’s poutine, or Hawaii’s Spam and eggs—regional specialties as bemusing to outsiders as they are beloved by locals. But it’s a relatively new phenomenon. Legend has it that the idea originated in the 1960s at the lunch counter of the old Woolworth’s (now the Five & Dime) and was served then, as it is now, directly in the bag. Even so, New Mexico and the old Woolworth’s don’t have a lock on the origin story. Some credit Carmen Ornelas for dreaming it up in the old bus depot’s café on Water Street in Santa Fe, where she worked in the 1950s. (To further confuse matters, she later worked at Woolworth’s.) My investigation at UNM’s Center for Southwest Research unearthed a reference as early as 1948 in the Las Cruces Sun-News. We may never know exactly where in New Mexico it first emerged. That matters because Texas holds a cross-claim on the dish. Kaleta Doolin, daughter of Fritos inventor Charles Doolin, says her San Antonio–based mother first made the dish in 1932 when she poured canned chili—meat, onions, tomatoes, beans, and spices—over her family’s corn chips. “The connection is really contentious, because the origins of the Frito pie remain shrouded in mystery—much like the way the dish is shrouded in the Frito bag,” Cline says. But Woolworth’s popularized the dish and established the crucial difference that makes it ours: New Mexico red chile. Chile with an e, not Texas-style chili with an i. Of the dozens of restaurant owners and cooks I spoke with, all agreed that Frito pie is, at its best, a celebration of authentic, unadulterated red chile. At Abraham’s Tiendita, a wonderful old candy store in Las Vegas, New Mexico, an excellent Frito pie comes covered in a red chile sauce made with garlic, chile powder, and crushed red chile flakes. “Straight up New Mexico chile, no other spices,” says a cook at Laguna Burger, another Frito pie favorite, on Laguna Pueblo, with a new outpost just south of 12th Street and Menaul Boulevard in Albuquerque. Even Blake’s Lotaburger, New Mexico’s largest local fast-food chain, has a Frito pie, one that marketing director Lucy Rosen assured me is made with “traditional red chile,” not Texas chili. The importance of that was made clear in 2013 when chef Anthony Bourdain came to New Mexico for his Parts Unknown TV show. For the episode, he stopped by the Five & Dime and, after being handed a Frito pie, made an off-color remark about it and then claimed, inaccurately, that it was made by “pouring canned Hormel chili” into the bag. New Mexicans rose up in anger. Every local paper covered the controversy, which was picked up by the Associated Press and carried as far away as England. Bourdain eventually said he had gotten it wrong. “I was stunned by the outcry,” Potter says. “There is a lot of emotion surrounding this food.” Nonetheless, the national attention apparently did little to hurt his sales. The Five & Dime now serves about 25,000 Frito pies a year. That feeling is the beauty of the Frito pie. A deeply New Mexican dish, an insider’s food that everyone can and should enjoy. Go out and find your favorite. Use its unpretentious accessibility to explore New Mexico and the places and restaurants you might otherwise pass up. You may find, as we did, hidden gems, those surprising and character-filled eateries where residents’ memories and feelings about Frito pie will fill you up as well. We asked Samuel Gilbert and Gabriela Campos to name a few of their favorite off-the-beaten-track dens of crunchy bagged goodness. A bustling restaurant located inside a pharmacy (opened in 1942) in historic Old Town. The Frito pie is a vehicle for Duran’s delicious red chile, some of the best in the city. Set within the 66 Pit Stop at the Laguna Superette, this charming old-style diner serves a massive Frito pie that makes the perfect, if messy, road snack. Inside this old candy store on the historic plaza, the Frito pie gets an added kick from the crushed red chiles in its sauce. 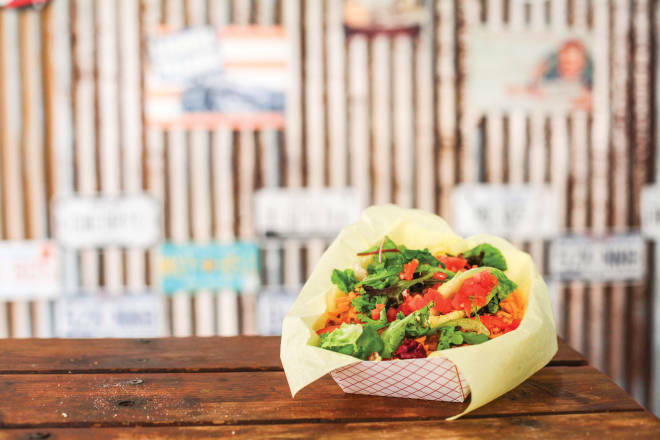 This cash-only restaurant in a tiny adobe house takes some driving, but the Frito pie is as good as the location. The original El Parasol in Española is the best. Order the Frito pie, served with either red or green chile, from the unassuming shack. Grab a plastic fork and a few napkins, sit down at a picnic table, and enjoy.